We are the team that will guide you to the ADCC road and provide you with more opportunities for progress in the world of submission fighting. 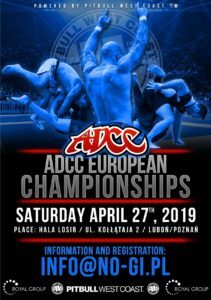 Follow our site where we will publis information about tournaments, events and everything related to the ADCC world. The Championship is tournament style; only winner goes through to the next round. Gee, Kimono & Wrestling Shoes are optional. No slippery substances allowed on body or clothing. The mat area is 9 x 9 meters, no cage or fence. If the fighters go out of this area, the referee will restart the fight in the center of the mat, in the same position they were when they left the mat when the referee said “Stop”. If the fighters were standing, they will start again facing each other. Qualifying Rounds* = 10 Minutes / 5 Minutes overtime if there is a draw with no advantage. (Max. 2 overtimes per fight) Finals** = 20 Minutes / 10 Minutes overtime if there is a draw with no advantage. (Max. 2 overtimes per fight) *On the “Qualifying Rounds” (10 min), the first 5 minutes are without points. The points are starting after the first 5 minutes until the end of the fight as well as on the overtime. **On the “Finals” (20 min), the first 10 minutes are without positive points, but negative points start from the beginning of the fight untill the end. The positive points are starting after the first 10 minutes until the end of the fight as well as on the overtime. Qualifying Rounds* = 6 Minutes / 3 Minutes overtime if there is a draw with no advantage. (Max. 1 overtime per fight) Finals** = 8 Minutes / 4 Minutes overtime if there is a draw with no advantage. (Max. 1 overtime per fight) *On the “Qualifying Rounds” (6 min), the first 3 minutes are without points. The points are starting after the first 3 minutes until the end of the fight as well as on the overtime. **On the “Finals” (8 min), the first 4 minutes are without positive points, but negative points start from the beginning of the fight untill the end. The positive points are starting after the first 4 minutes until the end of the fight as well as on the overtime. Each position must be established for 3 seconds or more being out of any danger of submission in order for points to be awarded. Passing the guard = 3 points Knee on stomach = 2 points Mount position = 2 points Back mount with hooks = 3 points Takedown (ends Guard or Half Guard) = 2 points Clean Takedown (ends passed the guard) = 4 points Sweeps (ends Guard or Half Guard) = 2 points Clean Sweep (ends passed the guard) = 4 points Sweep is considered when two fighters are facing each other, change the position from bottom to top and establish it for 3 sec. or more. Reversals are considered Sweeps as well. When changing multiple positions, points will be awarded only for the position that has been established for 3 seconds or more. Every sweep has to be done in one continuous motion in order to be awarded with points. Points for a sweep will be awarded only if the fighter initiates the sweep, not if he is being attacked by his opponent and he ends up on top. When passing the guard going straight to mount or knee on the stomach in less than 3 seconds points will be given only for passing the guard. When a fighter voluntarily jumps in the guard or goes from standing position to a non-standing position by any means and remains down for 3 seconds or more, he will be punished by a minus point. When a fighter disengages from contact and starts backing up and avoids engaging again he will be punished by minus point. A passive fighter will be warned twice and then will be punished by minus point. The referee will warn the passive player by the words “WARNING PASSIVITY” – after the first minus given there are not going to be any more warnings and the minus points will be given right-away if the fighter continues to be passive. If a fighter is very passive during the first half of the regular fights when there are no minuses, the referees will still give him WARNINGs for passivity and will punish him with a negative point when the second half of the fight starts! If two fighters (team-mates) make a fixed fight, they will both be disqualified from the tournament.